Though Scott Lobdell's Superboy Vol. 2: Extraction doesn't break any new ground necessarily, fans of Superboy Kon-El's various solo series should find something to like here. Lobdell generally does right by the cloned Kryptonian; new Superboy writer Tom DeFalco's issues suffer a bit, if perhaps from the effect of fill-in artists, though there's plenty hints that better things are on their way. Extraction, with Teen Titans Vol. 2 and Legion Lost Vol. 2, collect amongst themselves all the parts of the "Culling" crossover between the titles. I had previously complimented "Culling" for how it seemed like one big story with all the characters, rather than each title focusing on its own characters as Green Lantern crossovers often do. Taking the two "Culling" issues collected at the beginning of this trade away from the rest of the crossover, however, does reveal them to be more Superboy-focused than I'd originally realized. The Superboy trade lacks the "what came before" pages that the Teen Titans volume has before its "Culling" issues, but again I think a reader who's only reading Superboy and not the other parts of "Culling" won't be confused. Lobdell narrates the stories in Superboy's voice (this voice being one of the best parts of Lobdell's Superboy stories), and the recaps that Superboy gives seem to me sufficient for the reader to understand what's happening (that, and the fact that very little actually happens in "Culling" except a series of fights). Those who thrilled to the romance between Superboy and Wonder Girl, mourned Superboy's death in Infinite Crisis, and then were stymied by what happened when Superboy returned, will enjoy Lobdell's first post-"Culling" issue, which sees Superboy and Wonder Girl trapped on a deserted island. Seems to me Lobdell still intends a Red Robin/Wonder Girl pairing (and rightly so, what with Superman dating Wonder Woman now and Superboy and Wonder Girl having been an item in the old universe), but the tension or perhaps rivalry between Superboy and Wonder Girl is fun, especially the bit where Wonder Girl introduces Superboy to food for the first time. The trade follows this issue with the "deserted island" issue from Teen Titans, which is useful for explaining how Superboy gets back to his own time. The Titans collection, though already overloaded with an issue of DC Universe Presents, could probably have used the Superboy issue included too, if only to explain why Superboy and Wonder Girl were popping out of a hatch in the bottom of the jungle ground. At this point, Lobdell moves to "plot" and DeFalco comes in for "script," beginning the transition between writers. The first of DeFalco's issues, a team-up between Superboy and the Titans' Bunker, plus a villain from Lobdell's Titans, is also fun; Bunker seems to steal the show in just about any comic he's in. I liked Lobdell and DeFalco's exploration of Superboy's morality -- he fights bad guys, yes, but he also sees no problem in "borrowing" money from a bank to support himself. In the old universe, Superboy and Supergirl were both ardent crimefighters almost from the start -- I think we'd never have seen Superboy rob a bank in the old universe -- and I appreciate that the writers are taking risks with these characters and making them more than just cookie-cutter superheroes. The art by Superboy artist R. B. Silva helps the transition from Lobdell to DeFalco feel more natural, though Silva's Bunker looks unusually wide (especially in his civilian clothes) as compared to how Brett Booth draws him rail-thin. The issue that follows, however, uses two guest artists and three inkers, and this plus washed-out colors lessens the impact of an already-troubled issue. Superboy is out at a club with his non-distinct new friends (who I hope don't become this title's supporting cast) -- the stereotypical "cool" guy, the stereotypical "brainy" guy, and so on. A woman with equally run-of-the-mill telepathic powers marches in to collect a debt from one of Superboy's friends, the Kid of Steel gets in the way, and a fight ensues. There's little that's impressive here (except a nicely grotesque two-page spread), and the lackluster art only contributes to the sense that for DeFalco, this one's a stumble. The book finishes more strongly, however, with the Zero Month issue by DeFalco and Silva, with much brighter colors. 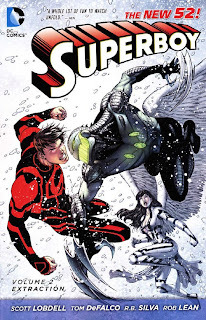 The origin issue simultaneously shows some behind-the-scenes action of the first issues of Superboy (making the ties to "Culling" a bit clearer) and also offers some insights into the New 52 Krypton (look for the Supergirl cameo appearance). We don't learn much we didn't already know here, but the end teases an epic confrontation between Superman and Superboy. I had not heard great things about the "He'l on Earth" crossover between the Super-titles, but this issue, and the foreshadowing of what might happen between Superman and Superboy, makes me much more eager. Had Extraction ended on issue #12, I might not have picked up the next Superboy trade, but the Zero Month issue restored my excitement for this series. Those still missing the Superboy in Smallville days may never be satisfied by Lobdell's take on the character (and heaven help those still missing the Superboy in Hawaii days), but I find this a rather refreshing take on the Superboy character -- and one that certainly finds its roots in the animated Young Justice Superboy, even if not in the comics that came before. It's hard to say who's extracting what from whom necessarily in Superboy: Extraction, but it won't be hard for DC to extract my money for the next volume. One more stop on this Teen Titans trip: a review of the Ravagers collection is coming up, plus Brian Woods's Star Wars and Matt Kindt's Mind MGMT! In my opinion, the deserted island issue was the highlight of the series so far. It reminded me of the great self-contained "downtime" issues Lobdell use to write after the big X-Men crossovers in the '90s, and the guest art by Sebastian Fiumara (who really deserves a regular gig) was gorgeous. DeFalco, in turn, had to take over the series mid-storyline and then jump straight into a crossover with the Superman family of books, after which he left, and his replacement Justin Jordan is about to leave after just 5 issues. Unfortunately, Superboy just can't seem to hold on to a creative team for very long, and I wish Lobdell had stayed on it instead of occasionally coming back for a guest stint. Superboy's having this problem, and Supergirl just had a creative team change, too. The Super-titles definitely need some stability, a kind of "rock" like the Bat-titles have with Snyder's Batman.